MT. PLEASANT, MI – For the second year, five local nonprofit leaders have been selected by the Mt. Pleasant Area Community Foundation (MPACF) to attend an eight month Leadership Learning Lab. Facilitated by NorthSky Nonprofit Network, the Leadership Learning Lab seeks to connect and empower nonprofit leaders and give them the skills to strengthen the organizations and communities they serve. Funded by the Frey Foundation and MPACF, the Leadership Learning Lab aligns with the Foundation’s strategic efforts to support capacity building among local nonprofits. The 2019 emerging leaders are Sarah Adkins, Holly Hansen-Watson, Kim McBryde, Jodi Stuber, and Wes Wickes. Sarah Adkins is attending on behalf of the Isabella Community Soup Kitchen, where she has served as Executive Director since last year. She is looking forward to taking advantage of this opportunity to further her knowledge of effective leadership, therefore making a positive impact on her organization and our community. Holly Hansen-Watson is attending on behalf of the Isabella County Foster Closet, where she has served as the Founder/Director since September 2014. She hopes that the professional development opportunity will allow her to improve the Foster Closet and better serve her community. Kim McBryde is attending on behalf of The Care Store, where she has served for the past 16 months. The Care Store was formally recognized as a separate charitable organization recently, and Kim is its founding Executive Director. She hopes the Leadership Learning Lab will strengthen her skills as she continues to lead change and growth at The Care Store. Jodi Stuber is attending on behalf of HopeWell Ranch, where she has served as Executive Director/Co-Founder since 2004. She hopes the program will help her grow as an individual and help HopeWell Ranch to be a stronger asset within the community. Wes Wickes is attending on behalf of Central Michigan Youth for Christ, where he has served as the Executive Director since 2008. He hopes the Leadership Learning Lab will give him the opportunity to expand his tool kit, challenge his skills, and encourage his call as a leader. To learn more about the Mt. Pleasant Area Community Foundation and their efforts to support local nonprofits, visit www.mpacf.org. MT. PLEASANT, MI - The Mt. Pleasant Area Community Foundation Board of Trustees recently awarded $38,660.04 in grants to organizations making an impact in Isabella County. Art Reach of Mid-Michigan received $826.05 from the W. Sidney and Judith F. Smith Community Fund for the 2019 Art Walk. This annual art competition takes place in downtown Mt. Pleasant. City of Mt. Pleasant received $1,500 from the Kellogg Youth Fund and $1,500 from the Morning Sun Community Fund for the Youth Police Academy, a three-week program in which youth are exposed to multiple police related topics by local law enforcement. Girls on the Run received $1,000.00 from the Kellogg Youth Fund, $1,000 from the Jerry M. and Marilyn A. Morey Community Fund and $1,000 from the Women's Initiative Fund to help with registration fees, for participants with financial need. Girl Scouts Heart of MI received $2,000 from the Women's Initiative Fund for a CPR manikin set, AED, and trainer certification. This funding will ensure that adult volunteers are able to ensure the safety and well-being of girls enrolled in Girl Scouts. Isabella Child Development Center received $387 from the Fisher Companies Community Impact Fund and $200 from the Women's Initiative Fund to purchase three tricycles. Isabella Citizens for Health received $2,050 from the Kellogg Youth Fund for a pediatric exam table. Currently, only adult sized exam tables are available. Isabella County Restoration House received $2,000 from the William and Janet Maar Strickler Community Impact Fund and $2,000 from the Women's Initiative Fund for transportation from the day shelter/intake center each evening to host churches, and then to the Isabella Community Soup Kitchen the following morning. Buses will be contracted to carry guests to and from shower facilities several times each week as well. Listening Ear received $2,332.06 from the Barbara A. Bissot Fund to purchase CPR and AED training manikins and other required materials to train employees servicing Listening Ear programs. McLaren Central Michigan received $5,000 from the Harkins Community Fund to purchase a 3D digital mammography machine. This machine provides improved screenings to detect cancerous growths in patients. Mt. Pleasant Community Church received $3,900 from the Women's Initiative Fund to purchase feminine products for The Care Store. This will pay for up to six months of supplies. R.I.S.E Advocacy received $1,000 from the Ranck Family Fund and $1,000 from the Women's Initiative Fund for CMU's Mobile Health Lab to provide basic medical evaluation for both in-shelter and outreach clients every other month beginning in March 2019. Shepherd Public Schools received $1,000 from the Shepherd Community Fund in Honor of Robert Bates to support the Shepherd High School After Prom, a safe alternative available to prom-goers between 11:15PM and 2:30AM on prom night. William and Janet Strickler Nonprofit Center, a facility that fosters a strong collaboration among key social service agencies in a shared physical space to reduce poverty levels in Isabella County over time. Village of Shepherd received $2,000 from the Shepherd Community Fund in Honor of Robert Bates to purchase two sets of posts to display business information at each off ramp of US127 coming into the Village of Shepherd. Applications for the next competitive grant cycle are due May 22, 2019. For more information on grant eligibility, and ways to support the endowed funds that make these grants possible, visit www.mpacf.org. The Mt. 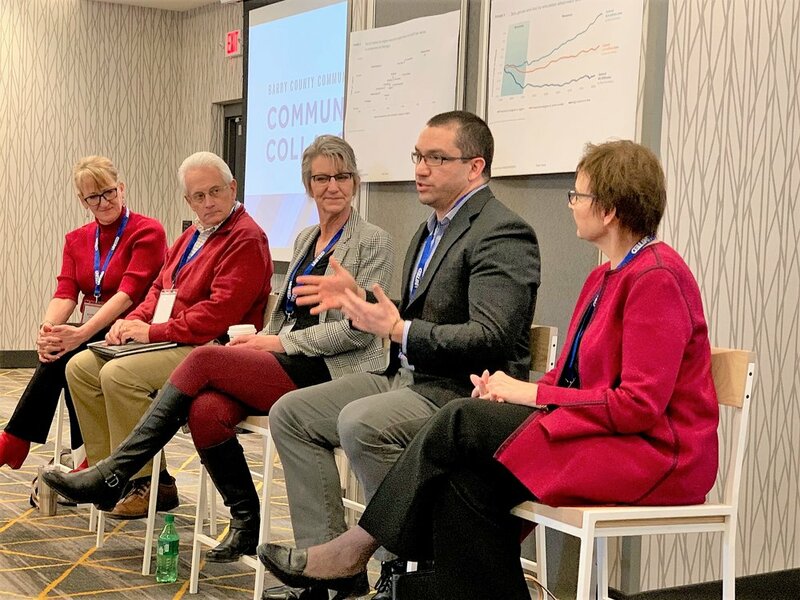 Pleasant Area Community Foundation (MPACF) joined forces with the United Way of Gratiot and Isabella Counties on Tuesday, February 26, 2019 to present a Community Leaders Mini-Conference. Modeling the collaborative behavior both organizations seek to encourage in others, the event focused on the results of an Isabella County Community Needs Assessment and explored potential solutions to address the greatest needs going forward. In early 2018, MPACF contracted with the Center for Applied Research and Rural Studies (CARRS) at Central Michigan University (CMU) to conduct a random sample needs assessment survey of Isabella County households. CARRS worked with the Community Foundation to develop survey questions with input from many local leaders. Upon completion, 531 households had either participated in an interview over the phone or returned a mailed questionnaire. During the Mini-Conference, Mary Senter, CARRS Director, presented key findings from the assessment. Community members are encouraged to view the full report, as well as an executive summary online. After hearing the assessment results, Mini-Conference participants split up for deeper conversations about the top two local needs identified. A discussion on “Access to Affordable Health Care” was led by Marita Hattem-Schiffman of MidMichigan Health, Jennifer McNally of Community Mental Health for Central Michigan, Tara Soules of McLaren Central Michigan, and Jennifer White of Isabella Citizens for Health. A discussion on “Jobs that Pay a Living Wage” was led by Craig Clark of Great Lakes Bay Michigan Works, Christine Hammond of Mid Michigan College, Jim McBryde of Middle Michigan Development Corporation, and Erin Strang of CMU Research Corporation. Amanda Schafer of MPACF and Annie Sanders of UWGIC ended the event by challenging participants to determine next steps for our community and to consider the role each was willing to play to affect change. MPACF seeks to shape the future of Isabella County by cultivating bold solutions for strong, vibrant, and inclusive communities. UWGIC envisions a strong community where everyone achieves their potential through quality education, financial stability and healthy lifestyles. The Mt. Pleasant Area Community Foundation is pleased to announce the appointment of two new Directors to its Board, Emma Powell and Steve Pung. Powell and Pung join twenty-two other community members who serve as Directors representing a wide range of professional expertise and organizational experience: Jay Anders, Jill Bourland, Bill Chilman, Shirley Martin Decker, Cheryl Gaudard, Dyke Heinze, Chuck Hubscher, Al Kaufmann, Dave Keilitz, Bob Long, Rick McGuirk, Linda Morey, Lon Morey, Mary Ann O'Neil, Marcie Otteman, Laura Richards, Brian Rush, Michelle Sponseller, Jan Strickler, Bob Wheeler, and Bryan Wieferich. The Mt. Pleasant Area Community Foundation is a tax-exempt public charity that seeks to enhance the quality of life for all citizens of Isabella County, now and for generations to come, by attracting and holding permanent endowed funds from a wide range of donors, addressing needs through grantmaking and providing leadership on key community issues. The Mt. Pleasant Area Community Foundation (MPACF) is now accepting applications for more than one hundred (100) scholarships. Most are available to local students who will be completing their senior year of high school or GED this spring. There are also more than a dozen scholarship opportunities for students already enrolled in, or planning to return to, some form of higher education. Frequently asked questions and a link to the online application system can be found at: www.mpacf.org. The application deadline is Friday, March 8, 2019. Since 1990, the Mt. Pleasant Area Community Foundation (MPACF) has transformed the unique charitable dreams of individuals, families, and businesses into the reality of permanently endowed charitable funds that support a wide range of worthy causes in the community. One-third of the permanently endowed funds held by MPACF provide scholarships, making the Community Foundation a leader in awarding scholarships to deserving students in the local area. Last year, MPACF awarded 91 scholarships totally more than $87,000 to students in and around Isabella County. In early 2018, the Mt. Pleasant Area Community Foundation (MPACF) contracted with the Center for Applied Research and Rural Studies (CARRS) at Central Michigan University (CMU) to conduct a random sample needs assessment survey of Isabella County households. CARRS worked with the Community Foundation to develop survey questions with input from many local leaders. Upon completion, 531 households had either participated in an interview over the phone or returned a mailed questionnaire. The Community Foundation has received a report on the survey results, and community members are encouraged to view the executive summary online. MPACF seeks to shape the future of Isabella County by cultivating bold solutions for strong, vibrant, and inclusive communities. In collaboration with the United Way of Gratiot and Isabella Counties, the Community Foundation will convene local community leaders in early 2019 to present the assessment results and explore potential solutions to address the greatest needs going forward. More details on this event will be available soon. Seven local nonprofit leaders, selected by the Mt. Pleasant Area Community Foundation (MPACF), recently celebrated the completion of an eight-month program focused on leadership development. Facilitated by NorthSky Nonprofit Network, the Leadership Learning Lab connects and empowers nonprofit leaders and gives them the skills to strengthen the organizations and communities they serve. Funded by the Frey Foundation and MPACF, the Leadership Learning Lab aligns with the Foundation’s strategic efforts to support capacity building among local nonprofits. Jon Breithaupt (Chippewa Watershed Conservancy), Kate Connors (Life Choices of Central Michigan), Ryan Griffus (Isabella County Restoration House), Samantha Jones (Girls on the Run of Central Michigan/Mid-Michigan Children’s Museum), Kaye Peasley (Clothing INC), Amy Powell (Art Reach of Mid Michigan), and Kim Seidel (Isabella County Child Advocacy Center) made up the first Isabella County cohort. Monthly sessions covered topics such as adaptive leadership, nonprofit board development, fund development, mission driven storytelling, grant writing and more. One participant described the experience as “…incredibly valuable in giving me the tools and confidence I need to become an emerging leader in my organization.” During a celebration ceremony on Thursday, December 13, participants were asked to describe their experience in one word. Responses included: equipped, empowered, and enriched. MPACF will offer the Leadership Learning Lab experience again in 2019 for five local nonprofit leaders. The second cohort will meet April through December. More information will be available in January. To learn more about the Mt. Pleasant Area Community Foundation and their efforts to support local nonprofits, visit www.mpacf.org. MT. PLEASANT, MI - The Mt. Pleasant Area Community Foundation Board of Trustees recently awarded $127,251.58 in grants to organizations impacting Isabella County. Art Reach of Mid Michigan received $1,300 from the Russ Herron Poetry Fund for the Wellspring Literary Series, a partnership program between CMU’s English Department and Art Reach. Published Poets and CMU students are invited to Art Reach to read their latest works, while CMU music students perform musical interludes. Beal City Public Schools received $681.76 from the Kellogg Youth Fund to provide two standing desks for Ms. Doyle’s classroom, which will accommodate two students at each. Big Brothers Big Sisters of Midland County Inc received a $2,500 grant from the Kimber and Judy DeWitt Family Fund, the Kellogg Youth Fund, and the Myler Family Community Impact Fund to provide support for one-on-one mentoring programs through new curriculum and mentor training. These new programs will yield a larger impact on mentors and mentees. Central Michigan University received $10,000 from an anonymous fund to support first year student success in the College of Liberal Arts and Social Services Interdisciplinary Program. Chippewa Watershed Conservancy received a $3,600 grant from the Bandit Industries Community Fund, the John P. and Ann S. Jensen Community Impact Fund, and the Missy and Doug LaBelle Family Foundation Community Impact Fund to provide Nature Preserve Signage and Marketing in order to promote awareness of and generate traffic of the public nature preserves maintained by the Chippewa Watershed Conservancy. Christmas Outreach of Isabella County received $3,000 from the Women's Initiative Fund to provide coats for women and girls in Isabella County, specifically size 2X to 5X, the least donated size. On average, Christmas Outreach spends $20 per coat – this grant will provide funding for 150 coats. Community Compassion Network received a $4,153 grant from the Sherwood Family Fund, the W. Sidney Smith and Judith French Smith Family Fund, and the William and Janet Maar Strickler Community Impact Fund, to provide an electric pallet jack and a warehouse trolley cart which will make moving large kitchen equipment and pallets of food easier. Community Compassion Network received $1,488.92 from the William Ellis Brockman Infant Assistance Fund to purchase diapers, pull-ups, baby formula, and baby food for distribution at the William Ellis Brockman Infant Pantry. Hopewell Ranch received a $4,112.40 grant from the Hersee Family Fund, the Summit Petroleum Fund, and the Theunissen Family Fund to support capital improvements to their existing indoor arena, specifically a new room to safely store horse feed. Isabella County Transportation Commission received $5,000 from the Rise Family Fund to support riders traveling to or from work, specifically riders from outside the limits of the City of Mt. Pleasant. The John H. Goodrow Fund received $4,800 grant from the Elizabeth Z. Miller & Bruce H. LaPointe Community Needs Fund, the Jerry M. and Marilyn A. Morey Community Fund, the Dr. Leonard E. and Louise A. Plachta Unrestricted Fund, and the Sullivan Family Fund to provide ten-trip bus passes to guests in need. Guests may request these passes up to two times during 2019. McLaren Central Michigan received $61,000 from the Central Michigan Community Hospital Fund to purchase a 3D Digital Mammography Machine. MSU Extension - Isabella County 4-H Program Council received $2,148 from the Kellogg Youth Fund to introduce youth to issues that are impacting the honeybee population, learn hands-on beekeeping techniques, and experience entrepreneurial opportunities through the sale of honey and hive products. Mount Pleasant Discovery Museum received $1,500 from the Kellogg Youth Fund to provide funding for repairs and upkeep of current exhibits, including; the Train Table, Farmers Market, and Beemazium Exhibits. Mount Pleasant Discovery Museum received $500 from the Janice Cotter Endowment Fund to support the mission of the Museum which hosts over 40,000 visitors annually. Mt. Pleasant Area Community Foundation – Nonprofit Service Center Fund received a $2,800 grant from the Gladys and Donald Mitchell Family Fund and the Rise Family Fund to help purchase the William and Janet Strickler Nonprofit Service Center. Mt. Pleasant Public Schools received $7,450 from the Esther Kraus Peacemaking Fund to send a counselor to the ‘Facing Race’ Conference in Detroit, MI. This grant will also utilize Persona Dolls which will be incorporated into Mindfulness Lessons. The Ronald McDonald House of Western Michigan received $2,700 grant from the Ruth S. and Gerard R. Felter and Florence F. Battenfeld Family Fund, the Bovee Family Fund, and the Morning Sun Community Fund to provide a “home away from home” for families living in Isabella County who must travel to Grand Rapids for critical medical and mental health treatment for their children. VSA Michigan received $1,800 from the Kellogg Youth Fund to provide 16 hours of learning through the arts for 224 receiving special education services through the Gratiot-Isabella RESD. This program will conclude with an exhibition of visual artwork created by the students, and demonstrations of the music that the students have created. Women’s Aid Service, Inc. (R.I.S.E.) received $3,000 from the Women’s Aid Service Fund which will support rebranding. This rebrand will place a renewed emphasis on effective marketing and outreach with a new logo and website. Women’s Aid Service, Inc. (R.I.S.E.) received $3,717.50 from the Olson Family Fund for support to update and renovate the main client restroom. Applications for the next competitive grant cycle are due January 23, 2019. For more information on grant eligibility, and ways to support the endowed funds that make these grants possible, visit www.mpacf.org. The Women's Initiative was founded in 2003 by a group of local women who wanted to provide for the needs of women and girls in Isabella County. "We learned that far too many women and girls in Isabella County were in need of serious help,” said Co-Founder Kay Smith at the time. “We believed that it was time for women to be given the opportunity to become philanthropists on their own--not as spouses or daughters, but as independent donors,” said Co-Founder Judy Smith. And that's what happened. While the initial goal in 2003 was to raise $50,000, the group raised more than $80,000 in just the first four weeks. “When the women of Isabella County learned that other women needed their help, they came through in a big way, and they continue to do so today!" Judy added. As an endowed fund of the Mt. Pleasant Area Community Foundation, contributions raised by the Women’s Initiative are pooled and invested. Since 2003, hundreds of women have made pledges to the Women’s Initiative Fund, and more than 2,100 individual gifts have been made. Women have given cash, appreciated stock and other assets, and often pay tribute to a friend or loved one by donating in their honor or memory. The Fund now holds nearly $400,000. Only the interest earned in the Fund is granted each year; this will allow grantmaking to community organizations benefiting women and girls, forever. Over the last fifteen years, more than 40 grants have been awarded to organizations like Big Brothers/Big Sisters of the Great Lakes Bay Region, Christian Counseling of Mid Michigan, Christmas Outreach, Community Compassion Network, Foster Closet of Michigan-Isabella County, Girls on the Run of Central Michigan, Girl Scouts Heart of Michigan, Isabella County Child Advocacy Center, Listening Ear Crisis Center, Mid Michigan College STEM Program for 8th Grade Girls, Mt. Pleasant Department of Public Safety, and Women’s Aid Service. On Tuesday, October 16, 2018, the Women’s Initiative will highlight the most recent grants awarded from the Fund during their “Look Who’s Talking” luncheon. The event is one of two annual fundraisers hosted by the Women’s Initiative. Half the ticket price of $50 will be added to the permanent endowment fund. The luncheon will feature Mt. Pleasant native and CNN political correspondent Sara Murray. 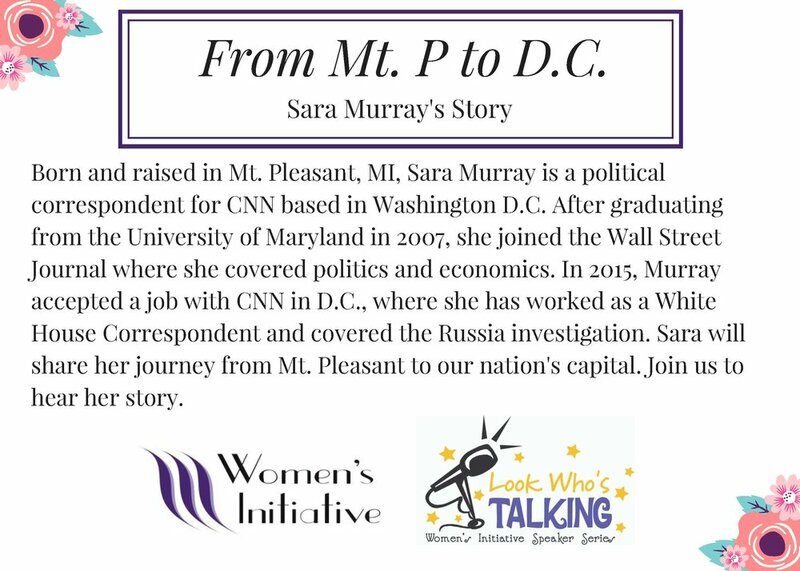 After graduating from the University of Maryland in 2007, Murray joined the Wall Street Journal where she covered politics and economics. In 2015, Murray accepted a job with CNN in Washington D.C., where she has worked as a White House Correspondent and covered the Russia investigation. Sara will share her journey from Mt. Pleasant to our nation’s capital with an audience of 400-500 event participants. McLaren Central Michigan and Mercantile Bank of Michigan are sponsoring this year’s speaker. The luncheon will take place at the Soaring Eagle Conference Center from 11:30 am to 1:30 pm. Complimentary valet parking is available at the hotel entrance. Tickets must be purchased in advance for the seated event from a member of the Women’s Initiative or directly from the Community Foundation. Tables of 8-10 may be purchased for reserved seating by visiting or calling the Community Foundation. Cash and check are accepted as payment. Two weeks ago, Jae Evans, CEO of Isabella Bank Corporation, stood up during Mt. Pleasant Area Community Foundation’s annual breakfast event and announced that Isabella Bank would match dollar for dollar the next $60,000 raised in the campaign for the Strickler Nonprofit Center. Since that announcement, $27,125 has been matched, bringing the total raised to $835,844. A group of nonprofit organizations focused on addressing poverty in Isabella County announced back in April that they planned to raise at least $1 million to make permanent a nonprofit center located at 1114 W. High Street in Mt. Pleasant. During the September 11th breakfast, Executive Director Amanda Schafer, and United Way’s CEO Annie Sanders, told the story of leasing the building from Victory Christian Church and transitioning it into space for at least four local charitable organizations serving those living in or near poverty. Community Compassion Network, Isabella County Restoration House, Clothing INC, and The Care Store provide critical services - food, shelter, clothing, and personal care items - and have been located under one roof since last fall. Long term, these partners and others are also committed to reducing overall poverty levels in Isabella County. Charlie Burke, a volunteer with the Center from the start, also shared his vision. “The Center will coordinate the development and implementation of services to train individuals with the necessary potential abilities to find, perform and keep employment,” Charlie said. Jan Strickler agreed back in April to make a lead gift to name the Center in memory of her husband, Bill. During the recent breakfast, Schafer shared that the fundraising team had decided to name the facility after both of them. Tearfully, Strickler joined Schafer on stage and encouraged those in attendance to reach out to an agency within the Center in order to volunteer. She then proudly declared the total raised to date was $781,594. “Several of you in the room have made gifts, and for that we thank you,” Strickler said. “We’d like to challenge you and the greater Isabella County community to help us raise $220,000 more between now and #GivingTuesday, a national day of charitable giving planned for November 27th.” Evans was the first to respond, pledging on behalf of the bank to match dollar for dollar the next $60,000 raised for the campaign. Community members may support the Strickler Center by contributing to a fund established for this purpose at the Community Foundation. Donations to the Center may be made at mpacf.org, and checks may be mailed to MPACF, PO Box 1283, Mt. Pleasant, MI 48804. Follow “William and Janet Strickler Nonprofit Center” on Facebook for regular updates. Two hundred and fifty community members gathered Tuesday morning for an update on Mt. Pleasant Area Community Foundation’s accomplishments over the last year in endowment building, grantmaking, and community leadership. In total, the Community Foundation ended 2017 with 287 permanent endowment funds. To these funds, as well as to a few special project funds at the Foundation, contributions in 2017 totaled more than any year prior - nearly $2.8 million. Ten new funds were established and gifts ranged from $5 to six figures. With an annualized investment return of 14.2%, the Foundation ended 2017 with nearly $21 million in assets. “The Community Foundation allows anyone and everyone to become a philanthropist, and there is no doubt that every gift, large or small, when properly invested, can enhance the lives of others,” said Treasurer and Finance Committee Chair Lynn Pohl. Nearly $600,000 in grants and scholarships were awarded in 2017. The largest sums supported education, human services, and sports/recreation. There were also significant resources awarded to causes related to community and economic development, health, arts and culture, and volunteerism. Linda Morey, Grant Review Committee Chair, shared some of the Foundation’s efforts to support capacity building among local nonprofit organizations through partnerships across the region and with CMU’s Nonprofit Leadership Student Alliance. Since 1990, the Community Foundation has awarded more than $6 million in student scholarships and grants to schools, local governments and charities. “That’s $6 million granted while also maintaining the value of every endowed gift ever given to the Foundation!” exclaimed Scholarship Committee Chair Cheryl Gaudard. Volunteers dedicated more than 6,000 hours of their time in service to the local community through the Foundation in 2017. To make decisions about grantmaking, many of these volunteers look for relevant and local data on areas where community improvement is most needed. The Foundation partnered with CMU’s Center for Applied Research and Rural Studies to conduct a community needs assessment this spring. A total of 531 Isabella County residents were interviewed by telephone or completed print surveys sent through the mail. Assessment results will be shared soon. The Foundation’s Board hopes to provide avenues for community dialogue about the most concerning issues, and ultimately to build collaborations to mobilize residents around those issues. Community Relations Chair Marcie Otteman Grawburg highlighted the recent launch of Epicenter Mt. Pleasant, a digital magazine funded by a coalition of Isabella County institutions that focuses on stories of talent, investment, innovation and emerging assets. Epicenter went live on August 16th and features stories about bold startups, emerging places, catalytic talent, transformative projects, and ideas across Isabella County. Grawburg encouraged breakfast participants to subscribe at bit.ly/SubscribeToEpicenter. The latter half of today’s program focused on updates related to the Nonprofit Center, the location of this year’s breakfast. The Foundation’s Executive Director Amanda Schafer, and new United Way CEO Annie Sanders, told the story of leasing the building from Victory Christian Church and transitioning the building at 1114 W. High Street into space for four local charitable organizations serving those living in or near poverty. Community Compassion Network, Isabella County Restoration House, Clothing INC, and The Care Store provide critical services--food, shelter, clothing, and personal care items--and have been located under one roof since last fall. Long term, these partners and others are also committed to reducing overall poverty levels in Isabella County. Charlie Burke, a volunteer with the Center from the start, also shared his vision for a Jobs Academy. “The Center will coordinate the development and implementation of services to train individuals with the necessary potential abilities to find, perform and keep employment,” Charlie said. In April, a fundraising team comprised of Nonprofit Center supporters announced a campaign to raise at least $1 million to purchase the building from Victory Christian Church to make the Center permanent. It was also announced that Janet Strickler had agreed to make a lead gift to name the Center in memory of her husband, William. Similar exciting announcements were made during this morning’s breakfast. Schafer shared that the fundraising team has decided to name the facility after both William and Janet. Tearfully, Strickler joined Schafer on stage and encouraged those in attendance to reach out to an agency within the Center in order to volunteer. She then proudly declared the total raised to date was $781,593.67. “Several of you in the room have made gifts, and for that we thank you,” Strickler said. “We’d like to challenge you and the greater Isabella County community to help us raise $220,000 more between now and #GivingTuesday, a national day of charitable giving planned for November 27th.” Jae Evans of Isabella Bank was the first to respond, pledging on behalf of the bank to match dollar for dollar the next $60,000 raised for the campaign. Community members are asked to support the Strickler Center by contributing to a fund established for this purpose at the Foundation. Donations to the Center may be made at mpacf.org, and checks may be mailed to MPACF, PO Box 1283, Mt. Pleasant, MI 48804. Breakfast participants were encouraged to follow the Strickler Center on Facebook for regular updates on volunteer opportunities and fundraising milestones. Questions about the Community Foundation and the announcements shared today should be directed to Amanda Schafer at (989) 773-7322. Questions about the direct services provided within the Strickler Center should be directed to the relevant partner agencies. Find links at mpacf.org. The Mt. Pleasant Area Community Foundation is thrilled to partner with a group of local institutions to launch the first edition of Epicenter Mt. Pleasant, a new publication about what's next and best in Isabella County, Michigan. This free web publication, part of Issue Media Group's statewide Second Wave Michigan network, will focus on the innovation, talent, entrepreneurship, and community development taking place in our community. Every week you'll see feature stories, profiles, news items and original photography highlighting innovative entrepreneurs, talented people, dedicated organizations, and devoted community builders. Issue Media Group (IMG) publishes a wide range of online magazines and websites in multiple markets across North America. Publications feature a variety of content consisting of timely news and resources related to lifestyle, cities, and economies. In each market, the Detroit-based media company promotes local assets and growth while working with community stakeholders in a coordinated effort to attract new talent, inspire business investment, and spur creative thought. MT. PLEASANT, MI - The Mt. Pleasant Area Community Foundation Board of Trustees recently awarded $63,835.12 in grants to organizations impacting Isabella County. Central Michigan District Health Department received $1,048 from the Isabella County Health Improvement Fund to purchase generators that will allow CMDHD to conduct vision and hearing tests on Isabella County children in places without electricity. Central Michigan University received $10,000 from the John R. and Constance M. Harkins Community Fund to provide busing for students in grades pre-k through twelve to the Museum of Cultural and Natural History. Christian Counseling of Mid-Michigan received $2,000 from the Healthy Youth Healthy Seniors Fund to provide custodial grandparents and their grandchildren counseling services related to their unique family environment and emotional needs. Clothing, INC received $939 from the Barbara L. and George W. Dunn Family Fund and $250 from the Kellogg Youth Fund to purchase laundry carts on wheels, as well as storage carts, which will allow for better sorting, processing, and storing of donated clothing. Community Compassion Network received $885 from the Women's Initiative Fund, which will allow CCN to provide diapers and formula to 95 babies within our community. First United Methodist Church received $250 from the Bob and Nancy Wheeler Fund for Scouting to provide camperships for two scouts from Troop 604 to attend Cole Canoe Base Scout Camp. Humane Animal Treatment Society received $1,159.12 from the LaBelle Family Fund to renovate the canine back building by removing old fencing and housing, installing new steel barriers and ceilings, securing gates and safety locks, creating a drainage system, and repairing structural damage. Isabella County Nonprofit Housing received $1,000 from the Healthy Youth Healthy Seniors Fund to provide engaging and educational programs covering multiple topics that include nutritional, health and safety, music therapy, art therapy, and more to Seniors 62 and older and for people that are mobility challenged. Life Choices of Central Michigan received $4,438 from the Community Impact Fund to provide funding for Sexually Transmitted Disease testing followed by an hour of education with a registered nurse. Mount Pleasant Little League received $1,200 from the Darlene Bond Memorial Youth Fund, $2,100 from the Kellogg Youth Fund, and $1,500 from the Optimist Club of Mt. Pleasant Fund for field improvements, including an upgraded sound system and new infield playing dirt. Michigan Masonic Home received $3,000 from the Community Impact Fund, $2,682 from the Barbara A. Bissot Fund, $3,564 from the Denison Unrestricted Fund, and $754 from the Missy and Doug LaBelle Family Foundation Community Impact Fund to purchase physical therapy equipment for the PACE program. This new program allows seniors who require nursing home level care to remain living in their homes by busing them to the building for social, medical, rehabilitative, and more services. Mt. Pleasant Community Church received $5,323 from the Community Impact Fund, $611 from the Joanne Golden Family Community Impact Fund, $2,647 from the Isabella Bank Director Memorial Fund, and $1,419 from the G. Charles and Janice L. Hubscher Fund to provide personal hygiene and household care products to individuals who have earned Care Bucks from local human service agencies. Potter's House Family Worship Center received $3,429.47 from the Kellogg Youth Fund to provide funding for the Power of Dad, a program which works to mentor, build character, and develop life skills in the lives of fatherless young men. This program seeks to end the cycle of fatherlessness in Isabella County. Safari Club International Foundation received $3,600 from the Mid-Michigan Chapter Safari Club International Fund to provide funding for four people to attend the American Wilderness Leadership School at Granite Ranch in Jackson Hole, Wyoming. Shepherd Public Schools received $71 from the David B. and Susan K. Keilitz Family Fund, $2,416 from the Kellogg Youth Fund, $1,129 from the Michael D. and Dianne C. Morey Community Needs Fund, and $5,021 from the Shepherd Area Community Fund in Honor of Robert Bates. This funding will provide renovations to the current computer lab to increase classroom safety as well as the creation of a mini STEM lab including a small robot. Shepherd Public Schools received $1,400 from the Kellogg Youth Fund to provide funding for #WhyYouMatter, a suicide prevention program. Students will craft a statement for why they matter and have their portrait taken by other students. These portraits will then be displayed in a gallery in May of 2019. Applications for the next competitive grant cycle are due September 26, 2018. For more information on grant eligibility, and ways to support the endowed funds that make these grants possible, visit mpacf.org. The Mt. Pleasant Area Community Foundation (MPACF) awarded 96 scholarships totaling $98,900 to local students during a reception on May 31, 2018. Established by individuals, businesses, and organizations wanting to help local students achieve their educational goals, most scholarships support high school students planning to attend an accredited college, university or trade school in the fall. Each scholarship is unique and reflects the values and interests of those who established it. For more information, or to support any one of these scholarships, contact Amanda Schafer, Executive Director, at (989) 773-7322 or visit www.mpacf.org. Photos from the reception may be found on the MPACF Facebook page. What does our community need? Where is the greatest potential to improve the quality of life in Isabella County? The public is invited to participate in an Isabella County Community Needs Assessment. The Mt. Pleasant Area Community Foundation has contracted with the Center for Applied Research and Rural Studies (CARRS) at Central Michigan University (CMU) to complete a survey of Isabella County residents. CARRS was founded in 1995 to assist community groups needing the social science research expertise of CMU faculty, staff, and students. CARRS partnered with the Community Foundation to develop the community needs assessment with input from several local leaders. A random sample of Isabella County residents was contacted over the course of the last few months via telephone and mail, and now the public as a whole is invited to respond to the online version of the survey. The survey can be accessed here and will remain open for two weeks. All responses will remain confidential, and no information that could identify individuals or households will ever be published. The survey will take about 10 minutes to complete. Those who have completed the survey via telephone or mail need not respond again. A summary report of the assessment findings will be shared with the community this fall. The Mt. Pleasant Area Community Foundation (MPACF) will award 96 scholarships totaling more than $98,900 to local students during a Scholarship Reception on May 31, 2018. Established by individuals, businesses, and organizations wanting to help local students achieve their educational goals, most scholarships support high school students planning to attend an accredited college, university or trade school in the fall. Each scholarship is unique and reflects the values and interests of those who established it. For more information or to support any one of these scholarships, contact Brittany Sherrill, Program Officer, at (989) 773-7322. Seven local nonprofit leaders have been selected by the Mt. Pleasant Area Community Foundation (MPACF) to attend an eight month Leadership Learning Lab. Facilitated by NorthSky Nonprofit Network, the Leadership Learning Lab seeks to connect and empower nonprofit leaders and give them the skills to strengthen the organizations and communities they serve. Funded by the Frey Foundation and MPACF, the Leadership Learning Lab aligns with the Foundation’s strategic efforts to support capacity building among local nonprofits. The emerging leaders are Jon Breithaupt, Kate Connors, Ryan Griffus, Samantha Jones, Kaye Peasley, Amy Powell and Kim Seidel. Jon Briethaupt is attending on behalf of the Chippewa Watershed Conservancy, where he has served as the Executive Director since October 2017. He hopes the program will provide training that will allow him to lead the Chippewa Watershed Conservancy towards growth so they may continue to preserve nature areas in Michigan to ensure a healthier, brighter future for the state. Kate Connors is attending on behalf of Life Choices of Central Michigan, where she has served as the President/CEO since January 2018. She hopes that the program will allow her to gain knowledge of effective leadership and create a network of other area nonprofit leaders as she takes on her new role. Ryan Giffus is attending on behalf of the Isabella County Restoration House, where he has served as the Executive Director since September 2016. He hopes this opportunity will allow him to gain an enhanced sense of leadership and a support system of other nonprofit leaders. Samantha Jones is attending on behalf of Girls on the Run of Central Michigan, where she has served as the Executive Director since July 2014. She hopes that the program will prepare her for the anticipated growth of Girls on the Run and help her lead the organization toward long term sustainability. Kaye Peasley is attending on behalf of Clothing INC, where she has served as the Director since February 2013. She hopes the Leadership Learning Lab will equip her with the tools to adapt to the growth of Clothing INC and create new, successful fundraising plans. Amy Powell is attending on behalf of Art Reach of Mid Michigan, where she has served as the Executive Director since July 2016. She hopes this opportunity will give her the tools to guide the organization toward long-term success and allow her to build connections with other local nonprofit leaders. Kim Seidel is attending on behalf of the Isabella County Child Advocacy Center, where she has served as the Executive Director since 2016. She hopes this opportunity will allow her to become more confident in her ability to secure financial resources and build collaborative relationships.